So until last Friday, I watched maybe 16 total minutes of Capitals hockey. Had I watched any more than that, I'd likely be in some sort of institution suffering from Trichotillomania. Needless to say, the Caps were horrendous on the road last week against teams that they should have easily dominated. I don't really know what to say about this, but I feel like I need to put my thoughts down. 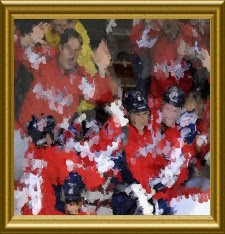 Between team in-fighting (see: Wideman v. Ovi; Angry Chimmer; Hunter Selling Out The Vokoun), senseless player benchings (ahem Mike Knuble), Rock Star Syndrome (see: Olie Kolzig's comments), trade speculation (Sasha Minor, Hammerhead, The Vokoun, Wides, Green, Carlson, MoJo...), and just complete thrashings at the hands of craptastic teams on national television-- our Caps seem doomed for utter failure. I'm not ready to give up, but something is rotten in the state of Denmark... er... District of Columbia. I'm not sure if its a Canadian v. European thing, an older guy v. younger guy thing, an Ovi-friend v. Ovi-foe thing-- but clearly, the guys on this team are not all BFFs. It's very frustrating. They're all individually so talented and they all seem like pretty good guys, so what's the deal? They're inability to get along and play well together is very upsetting to me. However, sometimes, they can really turn it on. Friday and Saturday's games against Montreal and Toronto were glimmers of hope. I watched both games from start to finish without breaking anything, crying, or hiding in a closet. Both games had great offense (4 goals in each), pretty stellar Neuvy goal-tending (only 3 goals against and none were really his fault-- though one goal came from Rene Borque and I find that unacceptable), and some quality D. The Caps were really physical, had a lot of energy, scored in the first period-- they were everything we would expect to see out of a team with that amount of talent. Those are 4 points we needed badly and it took a lot of work to get them. Caps are heading into a 5 game homestand against some really difficult teams and they need every point. They need to get their acts together and play even better than they played this weekend. At one point in the Toronto game, Phil Kessel had a breakway opportunity; after Neuvy made a great save, he basically lost his sh*t and ranted as his teammates for leaving him out to dry. Kudos to Neuvy for standing up to the guys in front-- they need to have his back because he cannot constantly bail them out of terrible plays. This is the last meeting between these two clubs this season. So far, Caps have gotten points in every game. 1 regulation win and 2 OT losses-- both went to shootouts, which in my book, is a draw. This should be a good game, though probably not a lot of offensive action. I like seeing Ovechkin and Semin on the ice with their former Olympic teammate and pal Ilya Kovalchuk. Let's see if they can catch old man Marty Brodeur on an off-night. Maybe he'll have another affair that will blow up in his face and will distract him? 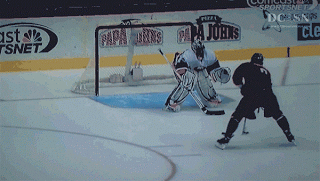 see: Real Goalies of New Jersey. 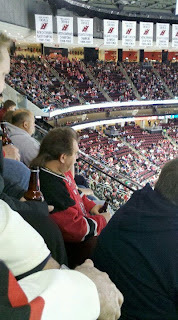 Despite growing up in Jersey, I was never a fan of the Devils and will never be a fan of the Devils.... 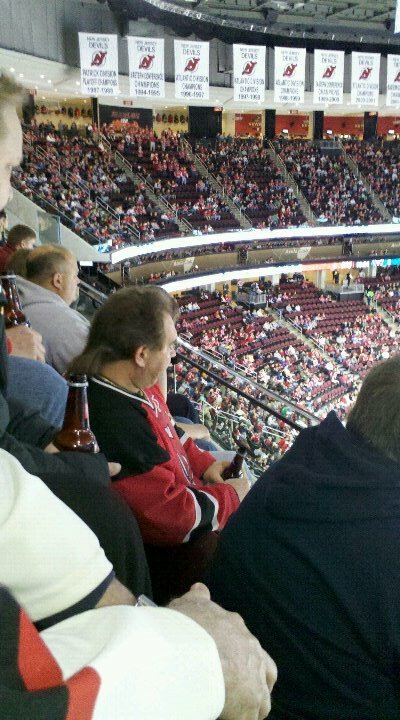 I sat behind this mullet-headed super fan at the game on Christmas Eve-Eve. He was not the only one of this....caliber. I can only assume he lives in the mountainous netherworld of north-western Jersey and only leaves his woodland home to attend games at The Rock and buy beer when his moonshine isn't done being distilled. This game is on NBC. The Caps will probably lose. It will probably be embarrassing. BUT maybe, just maybe they can eek out an OT loss? Is that asking for too much? Probably.... Unrelated, I'm having some really conflicting emotions about Scott Hartnell, Claude Giroux, Max Talbot, and Ilya Bryzgalov. I like them all. Husband stated following Hartsy on Twitter... I haven't gone that far yet... but this is really becoming a problem for me. I am genetically pre-dispositioned to loathe everything and anything related to the cesspool that is Philadelphia...and yet I find that these players are really fascinating...I may require an intervention. Stay tuned. I did not watch the game last Monday and I am glad I was spared every miserable second of that sad thrashing. That said, its time for the tables to turn. The Caps HAVE to win this. They have no choice. Carolina's even worse than NY (27th), so Caps need to dominate them. I want to see the floor wept with Eric Staal. I want to see Cam Ward crying in the net. Every line needs to be energized and on-point, hitting and crashing the net HARD. A wise man (?) once said: "Do or do not. There is no try." The Caps must tap into their Jedi mind tricks and make things happen. Same deal as the 'Canes, though Tampa is a mildly better team (24th). They're still pushing for the playoffs, so Caps need to shut them down and keep the two points for themselves and stay above them in the division. Two games ago saw a terribly illegal goal by Martin St. Louis. I'm still not over it because that goal made a huge different in the game. We need to get it back. We need to dominate them. So that's that. Crash the net. Unleash the fury. Win all the points. Don't let us down!